In this week’s installment of our Hearse Legends series, we’re taking a look at an urban legend that comes out of Ohio. Summit County is in Northeast Ohio, near Akron, and is known for its beautiful parks, music venues and a host of other attractions scattered across the county. While there are plenty of family friendly attractions throughout Summit County, the northern part of the county is known for an entirely different reason. Helltown is the unofficial name given to an area made up of a cluster of smaller towns. The small towns – Boston Township, Boston Village, Sagamore Hills and Northfield Center Township – are commonly referred to as the Boston Mills area. But for locals – and adventure seekers – it’s also known as Helltown. The area was originally settled in the early 1800s and quickly became a hub of production for a number of mills that used trees to create building materials and paper. The mills were such a big part of the community and local economy that when a railroad station was built in the 1880s it was named Boston Mills in reference to the local industry. By the 1960s, however, a growing number of people were concerned about the destruction of forests throughout the country – including in the Boston Mills area. In 1974, President Ford signed off on legislation that allowed the National Park Service to purchase land in order to enhance the National Park system. The legislation also allowed the use of ’eminent domain’ to acquire land and, once it was passed, the government began buying up land – and homes – throughout the Boston Mills area. As a result, droves of residents were forced to relocate. As more and more people were forced out and trees became protected, the local economy suffered and, in the end, much of the Boston Mills area was absorbed into the Cuyahoga Valley National Park. As the government bought more homes, the houses often sat vacant until they could be demolished. The area gave every appearance of being a ghost town,particularly to people passing through. Many people say this is where the legends surrounding Helltown began. There are a number of urban legends and rumors when it comes to Helltown. Some people claim the town was evacuated not because of the parks, but because of a deadly chemical spill the government wanted to cover up. Although there is no official record of any such spill, it’s a legend that continues to this day. Rumors about the local cemetery are also popular. In one story, people claim to have seen a ghost that sits on a bench in the cemetery. Visitors say the ghost does not move or interact – just that it sits staring blankly into space. There are rarely any other details given about the ghost which makes it hard to compare versions. Another cemetery-based rumor is that the trees in the cemetery move in unnatural ways. Rumors about the trees persist and people claim the origin could be the restless souls of children in the cemetery or even the involvement of a Satanic cult. Other local legends include stories of a school bus full of children being slaughtered by a serial killer (though sometimes the story features an escaped mental patient instead) as well as abandoned houses with lights that mysteriously come on and that at least two of the local churches are used as covers for evil cults. While there are plenty of stories about Helltown, the most famous is about the Haunted Hearse. The area of Helltown is littered with dead-end streets lined with abandoned homes and plenty of trees and overgrown vines that give the area a decidedly creepy feel, especially at night. Locals claim that if you drive down certain roads you’ll find yourself being chased by a hearse which appears to have a ghostly looking man at the wheel. 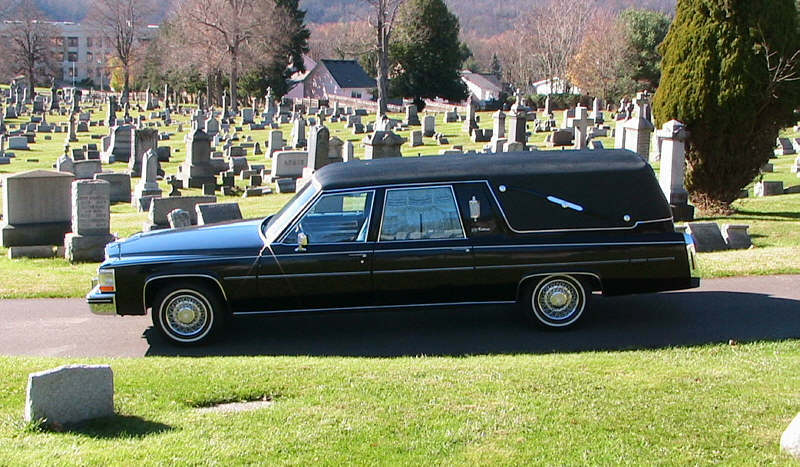 In some stories the hearse appears out of nowhere and in others the car has only one, weak headlight. Some of the stories have connected this ghostly hearse with the number of fatalities on Standford Road (aka ‘The End of the World’). Stanford Road has its own grisly reputation – locals and urban myth believers claim the road is cursed and drivers risk having a fatal crash if they choose to drive down the road. Some claim the road itself is possessed while others say that evil spirits possess the drivers and force them to crash the car purposely. Even cynics of the legends have to admit that Standford Road, with it’s sharp turns and steep inclines, is the scene of fatal crashes quite often. As far as the haunted hearse of Helltown goes, however, there are records that show a family did own a hearse at one time in the small town. They drove it around mostly around Halloween and became a regular feature in the landscape of the town. Skeptics point out that the road in question is marked by a large “ROAD CLOSED” sign nd that there is even a gate that goes across the road and is locked tight. The road is surrounded by dense woods on either side, making it impossible for a hearse to even drive down the road. Then again, none of that would matter if the hearse is a ghostly apparition. Either way, the legends and urban myths surrounding Helltown have turned it into a cult favorite for local adventure seekers. It has become a fairly well-known attraction for people throughout Ohio and urban explorers from the surrounding area. In the end, Helltown’s network or legends and creepy appearance could be what breathes new life into the modern day ghost town.